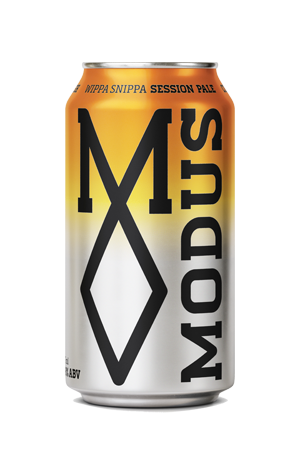 With the move from 500ml to 375ml cans, Modus have made it easier for their fans to grab a four-pack off the shelf for a quiet night in. They’ve made it easier again by adding Wippa Snippa to their core range at the same time. Some of us remember this beer’s ancestor from 2016, the Whippa Snipa Session IPA. The new Wippa Snippa bears some similarities, but has also been tweaked in all the right places. It’s dropped from 4.1 percent to 3.8 percent ABV, officially bringing it into the realm of mid-strength beers. They’ve move from calling it a Session IPA to calling it a Session Pale Ale. They’ve changed the spelling to make the pronunciation a little more intuitive (using “Snipa” to denote “session IPA” was well-intentioned, but perhaps a little clunky). And, last but not least, they’ve kept the Citra and Chinook, but swapped out Simcoe for Motueka. The resulting beer has a golden glow, giving off clear aromas of orange zest and melon, with broader tropical fruit flavours revealing just a touch of grain in the finish. All of this is somehow pulled off with a smooth body and a fair share of bitterness – none of that wateriness that can be the telltale sign of a mid-strength. With Modus’ track record of stellar hoppy beers, perhaps it shouldn’t be a surprise that the newest addition to their core range hits the mark. But a mid-strength that stands up to next to its bigger brothers is always a happy find.